We recently had some family visit us from Taiwan and they had heard of the Clam Warehouse from friends. 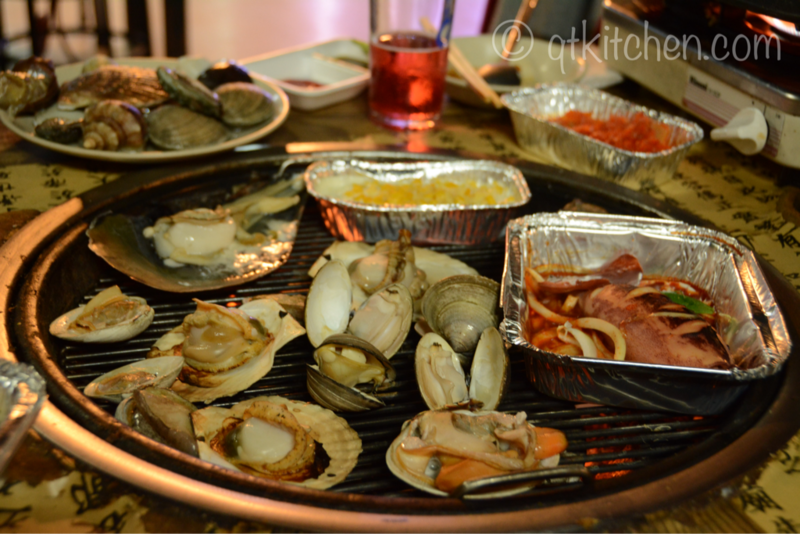 Clam Warehouse is an all-you-can-eat BBQ that offers unlimited fresh seafood as well as meat and side dishes. 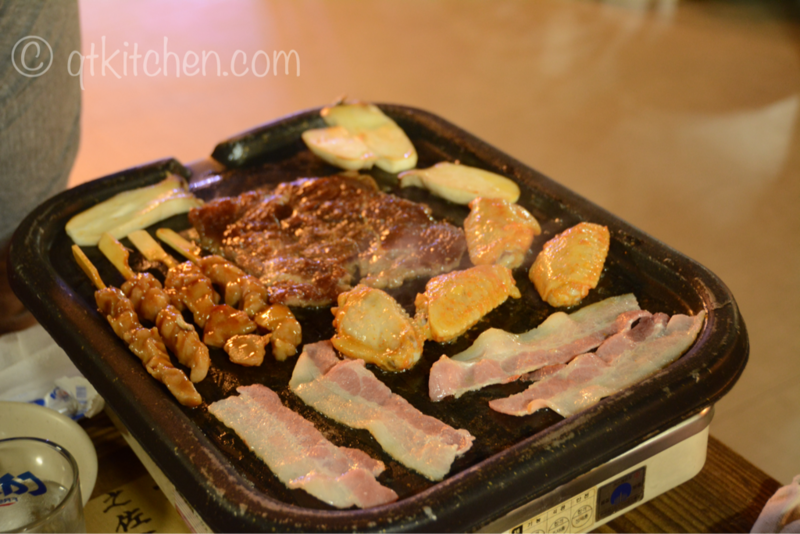 It’s pretty conveniently located near Wangsimni Station and best of all the price is affordable and there is no time limit! The restaurant is open Monday through Friday from 5 PM to 1 AM and Sunday and Holidays from 5 PM to Midnight. 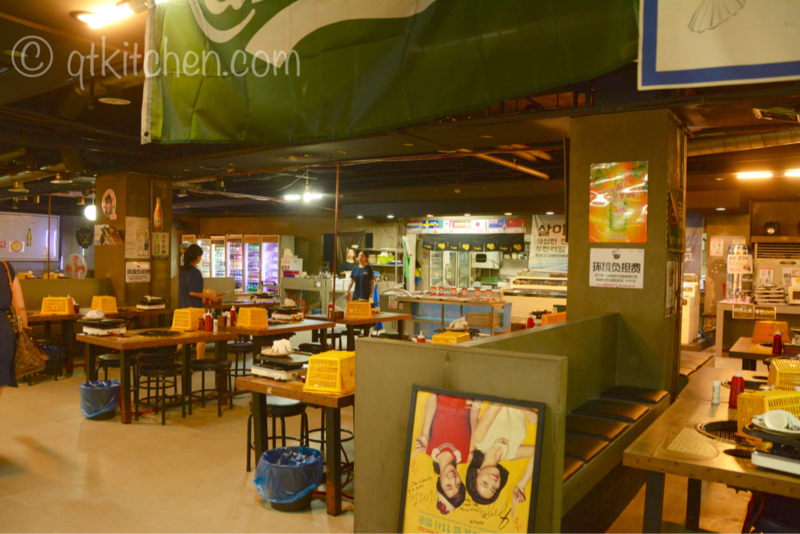 The kitchen closes 1 hour before the closing time. Trust me that is plenty of time to get your fill of both sea and land noms. The recommended modes of transportation are via subway or taxi (there is no parking here and they tell you to leave your car at home!). 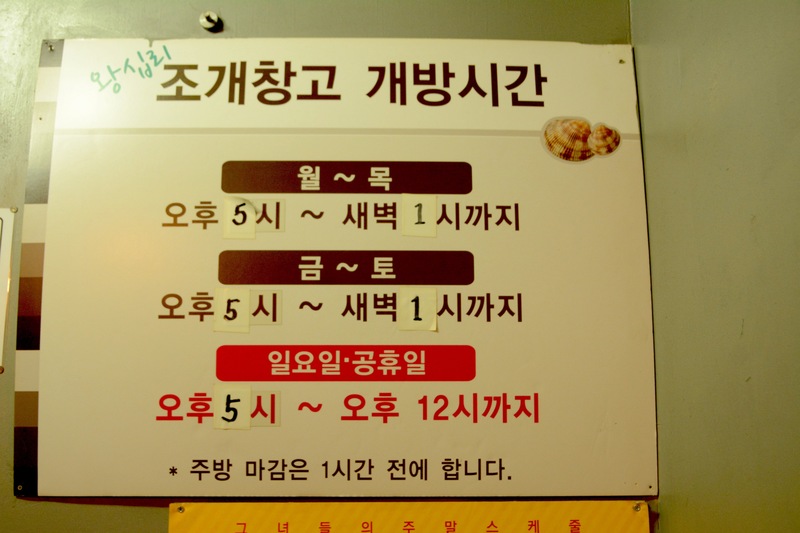 To get to the restaurant by subway, take line 2 or line 5 to Wangsimni Station and use Exit 11. 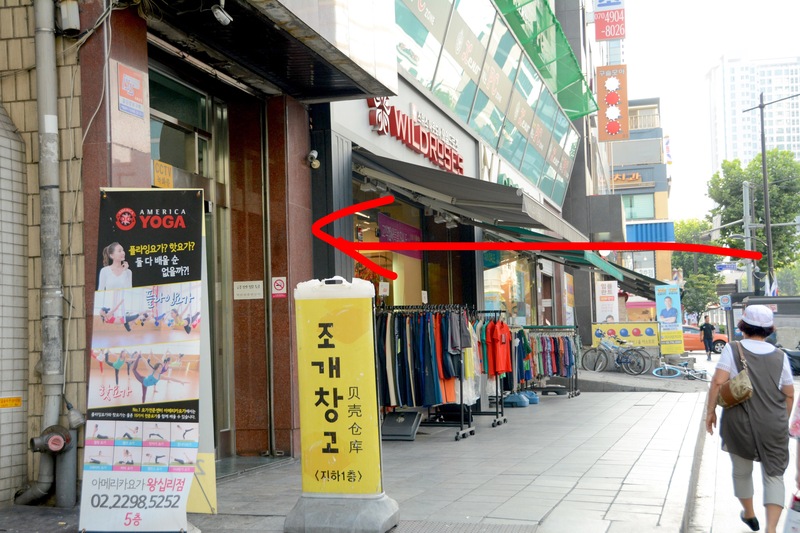 Then walk about 150 meters (about 5 minutes) and you will see Wildroses clothing store on the left, there is an entrance before the Wildroses store and you will go down to B1. As soon as you get in the stairwell you will see the signs pointing you down to the restaurant. We had heard that it fills up pretty quick and, as you can imagine, with no time limit you could be waiting for awhile. However, when we arrived around 5:30 PM, there were only 2 other tables there. It did fill up some, but there was no wait. The restaurant is definitely bare bones (like the warehouse name implies), but it is spacious and they had 2 huge tanks full of shellfish. So now here’s the best part, it is only 27,500 per person, I think that’s pretty reasonable for all you can eat live seafood, plus meat, plus sides. Do remember that drinks are a separate charge, but prices were reasonable. Cass/Kloud beers were 3,500 each (they were the smaller 12 oz bottles though) and they also had a pretty decent selection of foreign beers for Korea priced at 5,500. Here is their table set up. You get one large grill, and one smaller grill. 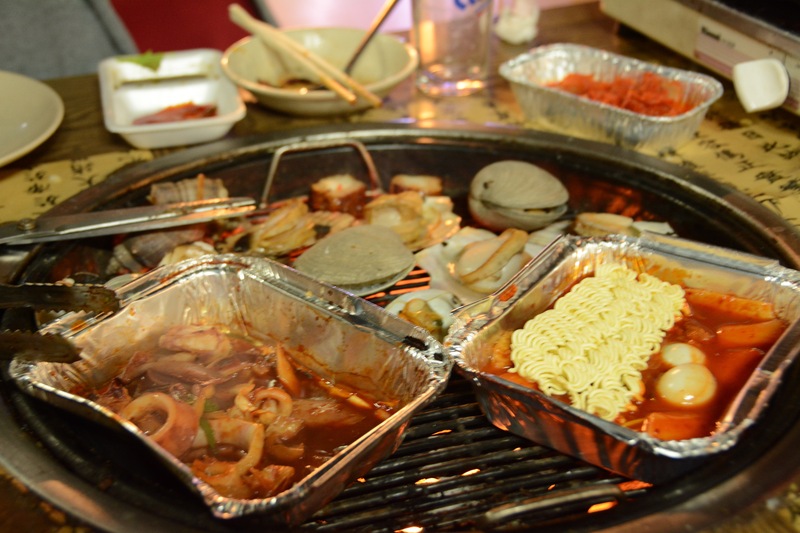 The one grill that is set in the table is ONLY for seafood and any of the side dishes in the foil pans (don’t get caught putting meat on there, they will not be so happy with you) and then there is a smaller grill that you can BBQ your meat on (make sure you wait for them to butter the pan for you before you start cooking on that grill pan). The servers will provide you with 2 plates, one is for seafood and the other is for meat. They are very modestly sized plates, I guess this is their way of making sure you can’t take too much at once. Then last but not least, there is a yellow basket that you can put your things in to keep them all together and out of the way. At the end of your meal, you will want to put any drink bottles that you consumed into the basket and take it up to the cashier to total up the damage. So another thing I want to mention is that unlike Todai and D’Maris buffets, this place is ALL self service so don’t expect much assistance. I mean down to your napkins, tongs, chopsticks, etc. They honestly do not bring anything to your table, except you. So you may be thinking “why would I want to go somewhere with no service whatsoever?,” well it is because of the stars of the show of course, and here they are! 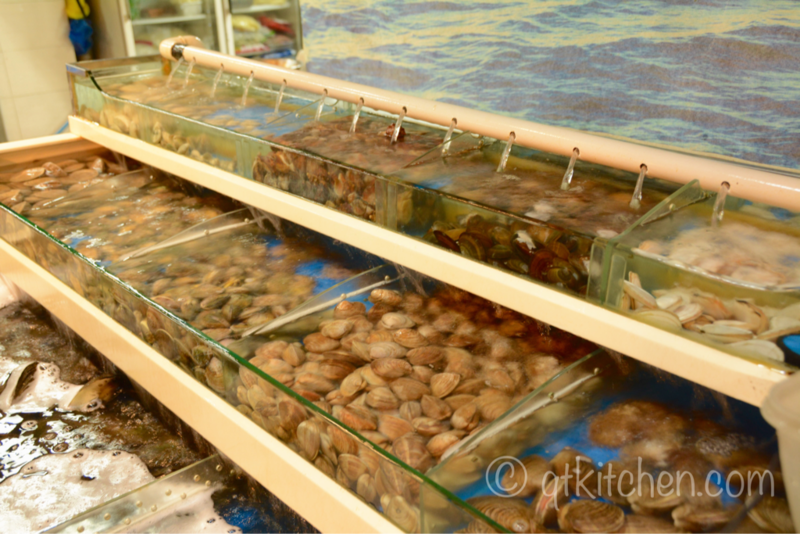 They have scallops, all kinds of clams (even giant clams), abalone, and some kind of snail. The only thing I was disappointed about was there was no shrimp. The seafood looked very fresh and you could see the workers checking them to make sure they were alive and well. Here’s the second case full of sea creatures! Here are the sides they offered. We tried the squid, which was in a sweet and spicy sauce. It was okay. I really did NOT like the kimchi, they added some tomato sauce or something to make it more red (I’m guessing red pepper powder is too expensive) and it was really gross to me. Our favorite thing was the sweet corn in a cheese sauce, it was really yummy, and went super good with the seafood. Finally, there is also a dish that looks like it is all cheese….well it is NOT…it’s actually mayonnaise with cheese on top. It was quite strange, and I’m not sure how someone could eat a whole dish of it. We scooped a little onto one of our scallops and it was okay. Here’s the meats and vegetables. We really enjoyed the chicken wings. Over in this case, we liked the chicken skewers and the marinated beef. The other things like the shrimp balls and fish cake we used when we made our ramen soup. 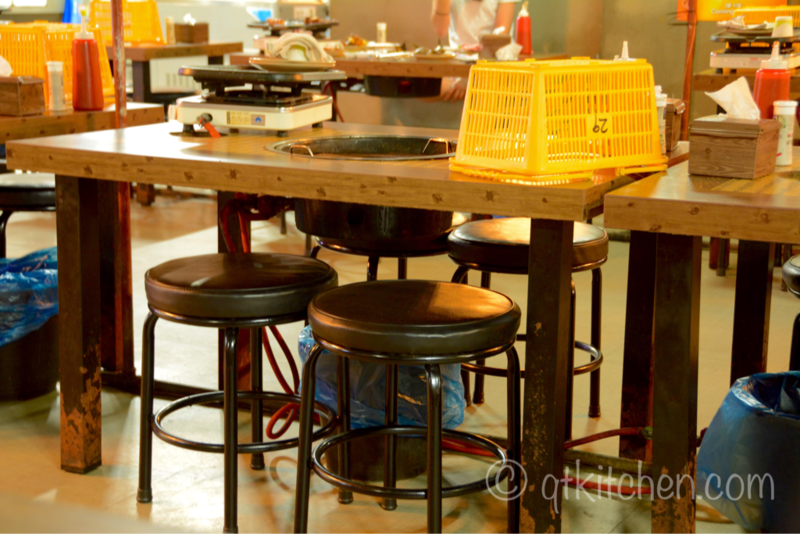 And last, but not least is the ramen stations. You take one of the pots with the ramen in it, then add some of the soup base that is in the small container between the water jug and the stack of ramen bowls and then add hot water. 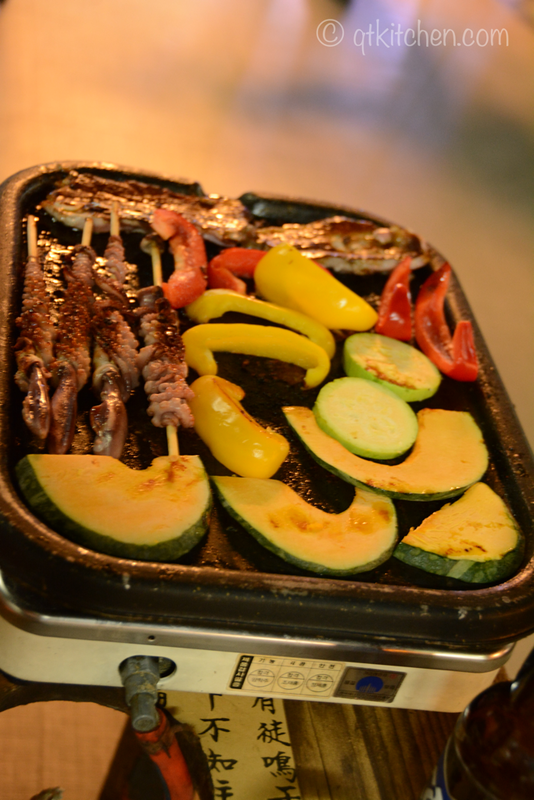 You can then go to the meat and vegetable bar and add in your favorite ingredients. Once you have your bowl, take it back to the table and place your little pot with your ramen on the burner where your grill plan is and then just wait for it to boil, and voila! It’s time for ramen soup. Let me forewarn you that with 2 grills going on at your table, the entire restaurant and you get’s hot quickly. The restaurant has AC units, and fans, but let me tell you, halfway into our meal, I felt like a chicken nugget under a heat lamp. So definitely be aware of that if you go. We are thinking next time we go it will need to be fall or preferably winter, so we can appreciate the warmth of the inside. So my last tip for this restaurant will be that they have a freezer case by the cashier full of ice cream, if you get too hot at any point just grab an ice cream/popsicle and cool down a bit. 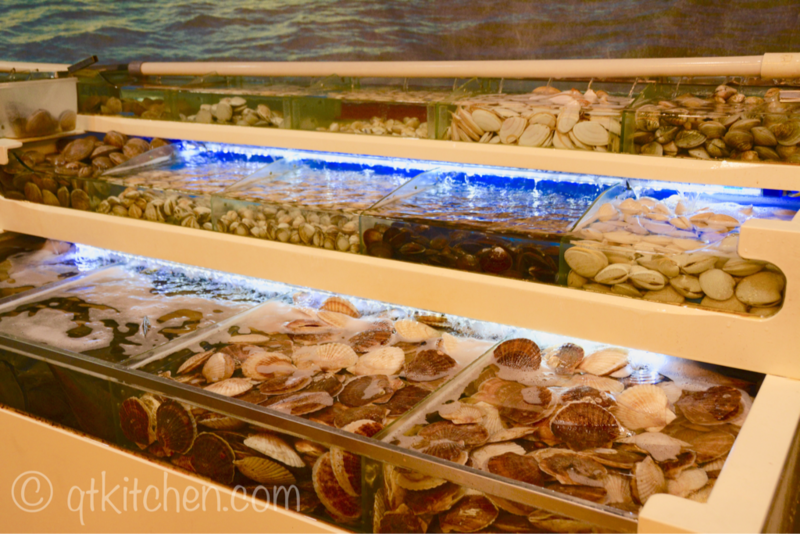 If you love shellfish, especially clams, definitely check out Clam Warehouse and get your fill. We enjoyed the food and it was all very fresh. We’ll be back!